In this study, our goal was to 1) evaluate the effect of insulin on HEK293SF-3F6 cell growth in two types of media, 2) boost influenza production with the addition of different concentrations of insulin, and 3) quantify influenza using a robust method. HEK293SF-3F6 is a suspension-adapted cell line (a GMP cell bank is available). HEK293SF-3F6 cells have successfully been used for the production of influenza virus, virus-like particles, lentiviral vectors, adenovirus and adeno-associated virus. HEK293SF-3F6 can be cultured in in-house media (IHM-03) and in commercially-available serum-free media (Hyaline), but weak growth profiles are obtained in chemically defined media. Growth limitations observed in a chemically defined media (CD293 media) were alleviated by insulin (Figure 1). 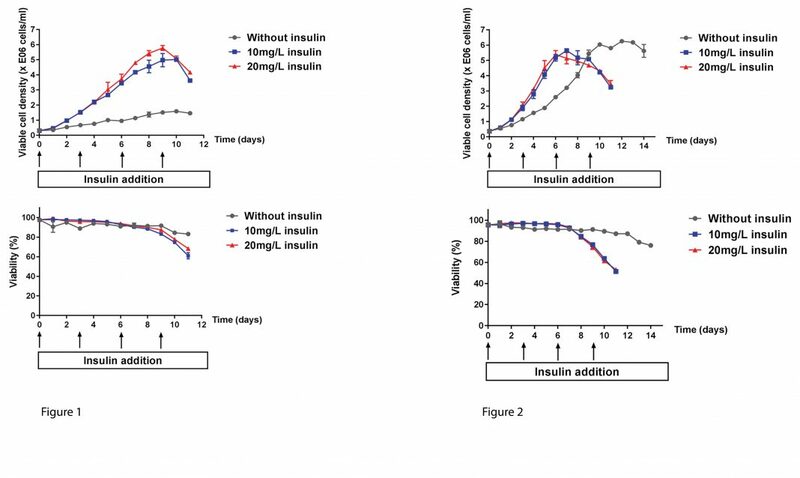 Growth kinetics were improved by insulin in an in-house media (IHM-03) (Figure 2). Figure 1. By adding 10–20mg/L insulin every 72 hours, the maximal viable cell density of HEK293SF-3F6 cells was increased by 4-fold in CD293 media. Figure 2. By adding 10–20mg/L insulin every 72 hours, the maximal viable cell density of HEK293SF-3F6 cells was reached three days sooner in IHM-03, a media designed specifically for HEK293SF-3F6 cells. Cell-culture-based vaccines are a valuable alternative to egg-­produced vaccines: the equivalent of 1,500 influenza vaccine doses can be produced in a 1-L bioreactor within 48 hours using HEK293 cells. • Increase in total HA was not due to increased cell density. • Similar results were obtained with H3N2 A/Aichi/2/68 treated with 5 and 25 mg/L insulin, respectively, at time of infection. 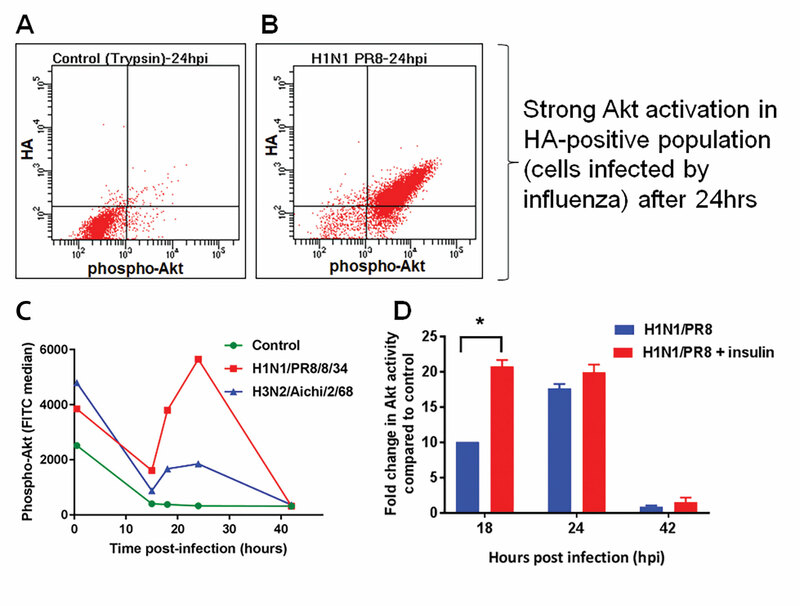 • Akt activity is increased by influenza infection and insulin addition in HEK293SF-3F6 cells (Figure 5). Figure 3. (A) Overview of signaling pathways modulated by influenza infection: the replication of influenza virus hijacks the cellular machinery and involves multiple signaling pathways, including Akt. (B) Akt is activated by viral NS-13. Figure 4. Addition of 25–100 mg/L insulin at time of infection Increases the yield of influenza H1N1 A/Puerto Rico 8/34 by almost 2-fold In CD293 media (A), without affecting the total cell count at harvest (B). The virus was added at an MOI of 0.01 at 35 oC in the presence of 1 µg/mL trypsin-TPCK. Hemagglutinin (HA) concentration was measured by dot-blot assay using pan-HA antibodies developed in house. Figure 5. HEK293 cells were infected in a shake flask. The control was treated with 1 µg/mL trypsin-TPCK (without virus). Phospho-Akt was measured by flow cytometry after infection and representative results are shown (A–B) and summarized (C). The addition of insulin further activates Akt (D). Results were obtained by dividing the fluorescence signal obtained for the infected sample by the untreated control (n=2). • Measures of infectivity are highly variable. • Physical methods to count viral particles can be confounded by the presence of nonviral particles. A pan-HA antibody cocktail was generated using a highly conserved peptide sequence found within the HA molecule (the fusion peptide) (Figures 6 and 7). Figure 6. Western blots of influenza strains belonging to 13 different subtypes. Influenza viruses were produced in eggs and probed with mAb 11H12 (A) or mAb 10A9 (B). When mixed together, the two mAbs make a pan-HA cocktail. Figure 7. Quantification by dot blot. A calibration curve ranging from 160 ng/mL to 20 µg/mL hemaggluttinin (HA) was obtained using a calibrating antigen of known concentration. Ten different samples produced in HEK293SF-3F6 cells were loaded in four dilutions and the concentration of HA was determined. Samples S4 and S5 were purified by sucrose-cushion, while the other samples were crude samples harvested after different treatments. The HEK293SF-3F6 cell-line platform is an ideal candidate for the development of commercial manufacturing processes of virus and viral vectors for vaccines and gene/cell therapy. Influenza concentration in supernatant was measured using pan-HA antibodies produced in house using a peptide­ conjugate derived from the fusion peptide. Overall, a concentration of 25 mg/L of insulin provided an increase in influenza yield regardless of the media or viral strain used in HEK293SF-3F6 cells. A concomitant activation of signaling pathways associated with cell survival (PI3K-Akt pathway) was observed. Aziza P. Manceur Ph.D. (Aziza.Manceur@cnrc-nrc.gc.ca), Sonia Tremblay, and Sven Ansorge, Ph.D., conduct research at the National Research Council in Montreal, Quebec, Canada. This bioprocess tutorial represents an edited and modified version of a poster presentation with the same title as the tutorial. 2. O. Planz, Antiviral Research 98 (3), (June 2013). 3. Group Hale, accessed on August 24, 2017. Thank you to Magnus Franzmann and Clare Medlow (Novo Nordisk Pharmatech) for scientific input and for providing insulin. The results described do not represent an endorsement of any product by NRC.